Everyone should consider Costa Rica property holding cost when purchasing property. The holding cost can include taxes, management fees, utilities, repairs, etc. Here is a little information to get you started. Property Tax: One of the great benefits of owning property in Costa Rica is due to low property taxes. Here we pay .25% of the registered value per year so on a property valued at $100,000 the annual taxes would be $250. Property taxes are payable quarterly but you can pay until the end of the year in advance and there is a 5% discount if you do so. In most urban districts there is also normally a fee for garbage collection and maintenance services and in our county called Garabito the trash collection is roughly $10.50 per month and is included in the property tax statement. The taxes can be paid at the local municipality or via wire transfer. Luxury Tax: If the construction value of a home or condo is over approximately $200,000 then there is an additional .25% to .55% luxury tax. In our region it is normally only the finest 3 bedroom + residences that have an applicable luxury tax and they are normally only subject to an additional .25%. Therefore, the total property taxes on such a luxury residence would be the normal .25% property tax + .25% luxury tax = .5%. 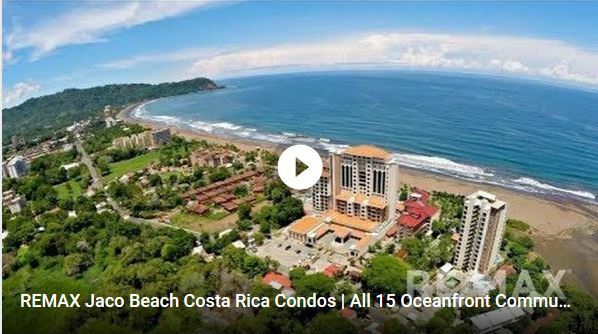 Hotel tax: Vacation rental properties are subject to a 13% value added tax as is added to all goods and services in Costa Rica. Most property managers will charge this to the renter and pay to the government on behalf of the owner. Income Tax: Under the Costa Rican tax system, residents and corporations are taxed only on income earned in Costa Rica. If you have a vacation rental property, then it would be necessary to file a tax return once a year and taxes would be paid on the net income. Deductions can be made for depreciation, travel expenses for 1% of the gross income declared, insurance premiums and any costs that are incurred necessary to produce the income. The tax year ends on September 30th and the annual tax has to be paid before Dec 15th. If you retire in Costa Rica, no matter where you come from, you probably pay taxes on your retirement income already. This exempts you from paying income tax in Costa Rica. Yes, retirees in Costa Rica do NOT pay any taxes on their foreign retirement income. You only pay income tax if you run a profitable business. Fortunately there is a high rental demand for homes and condos in our area especially with the popularity of websites like www.airbnb.com, www.vrbo.com, www.booking.com and more. Many purchasers do not live full time in Costa Rica so they are in need of a property manager of whom there are many to choose from. These managers maintain the property with preventative maintenance, are on call to service any issues and typically offer accounting service in which they will pay all the owners bills on their behalf such as utilities, property taxes, HOA fees, etc. Some managers will charge a monthly fee for these services normally around $100 while other managers will perform these duties at no extra cost if the owner exclusively rents their property with them. Managers will not have any restrictions on how often owners are allowed to stay in their own property. Typically the top producing managers in our area are charging a 35% commission on the rental income on short term rentals and 20% on rentals over one month. The managers are normally marketing their properties on all the popular websites as well as promoting through their own personal websites, social media and both local and international advertising. Some owners are good at generating their own rentals in which case most managers will offer a “key fee” or “check in fee” meaning that instead of charging a percentage of the rent that they will charge a set fee per check-in if the owner books the rental. Check in fees range from $30 to $125 per reservation depending on length of stay and quality of the property and for that fee the manager will perform all the same duties of checking the guest in and out and normally offering concierge services by helping to arrange transportation, tours and other services. Once the guest departs, the manager will coordinate the cleaning and verify the inventory to make sure that nothing was broken, stolen or stained. For example, if an owner books a reservation on their own for one week for $1,000, then the owner would send the guest to the manager and they would take care of them from there. The manager will charge a “check in fee” and for the sake of example let’s use $75 and the balance would belong to the owner. Then the manager would coordinate the cleaning and then bill the owner for the maid service. Some management companies perform better than others at certain developments and communities and we can guide you to those companies depending on where you are considering purchasing.